A young wife stabbed her wealthy older husband to death after finding a condom in his trouser pocket while doing the laundry. 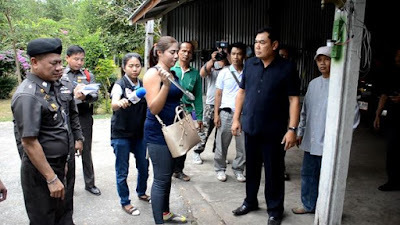 Nittaya Saengdeuan, 22, murdered landowner Amnuay Wansila, 62, on Tuesday morning at their home in Udon Thani, Thailand. The furious wife initially blamed it on intruders but eventually admitted her guilt, said police - who made her reenact what happened. She told officers her husband had got violent and had pushed her over before she grabbed a knife and stabbed him before chasing him into garage and plunging the blade into him dozens more times. Amnuay's body was later found dumped in a septic tank after police arrived at the blood-splattered scene at their farm later that morning. 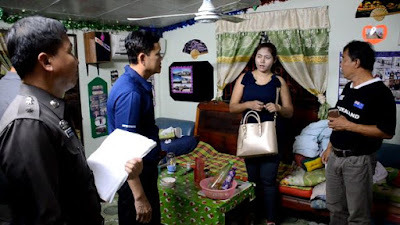 Police Major General Peerapong Wongsamaan, Commander of Udon Thani Provincial Police, said the wife had initially called police herself and claimed that intruders had killed her husband. But he said that officers were suspicious of her story and grilled her throughout the night before she confessed and was taken for a crime re-enactment on Wednesday morning. She was filmed holding a kitchen utensil of a similar size to the knife, demonstrating how she stabbed her husband in the kitchen then again in the garage. Pol Maj Gen Wongsamaan said: "The cause of the murder was a fight in the family linked to jealousy. The dead man pushed his wife down. She got angry and took a knife to her husband. "The dead man ran away and fell down in the garage. His wife then repeatedly stabbed him to death. After that she tried to hide the body and destroy the evidence. "She could not remove the bloodstains so her plan changed. She made up a story that the villain was someone else who arrived at the home and killed her husband while she locked herself inside." 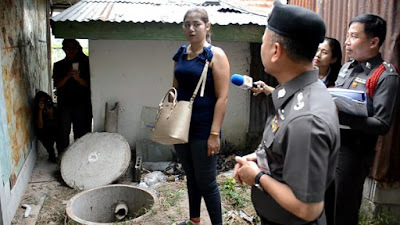 Nitaya told police that the argument started when she found a condom in her husband's trouser pocket while doing the laundry - and she accused him of having a younger mistress and he became violent .